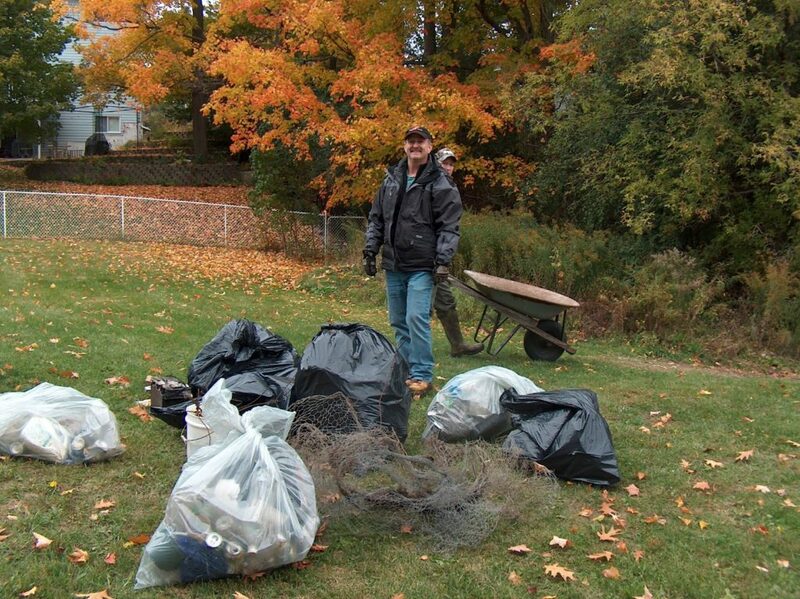 Well, it seems like only yesterday, but it was actually October 13’th acknowledged the beleaguered blogger, that a fantastic group of 14 enthusiastic stewards hauled some major trash out of Bridlewood and Harper Parks. An important goal of the HPSI is to promote nature-based education, as well as aesthetic and spiritual enjoyment of Harper Park. Removing hazards from the park facilitates this goal by increasing the safety of those who regularly enjoy the natural beauty of this ecologically diverse nature area through quiet walks, photography and bird watching. 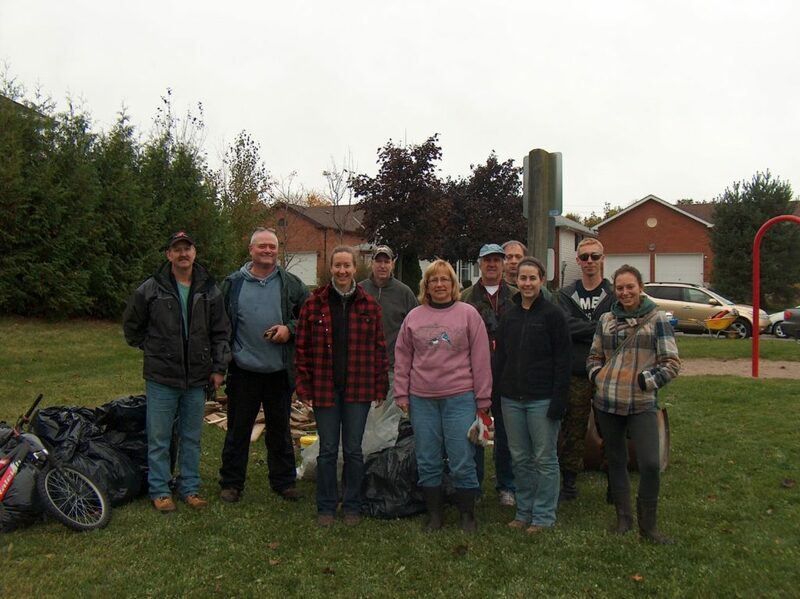 Waste wood, decking and patio materials, wire, bottles and cans were safely removed from both Bridlewood and Harper Park by HPSI members and Trent University students. Thinking reuse before recycling, members ensured that the bicycle was donated to a local bike organization for parts, or repair and reuse. In the spirit of promoting nature based education, our Community Stream Steward Coordinator led the group through the basic use of hand-held GPS units. Volunteers then divided up into teams, and headed off to clean-up, as well as to explore the boundaries and features of the park complex. The GPS waypoints have now been transferred to a spreadsheet awaiting upload to GIS software. This mapping effort will be shared with the City of Peterborough and will highlight interesting natural features, facilitate the location of boundaries between private and public property, and will also identify the location of larger items requiring removal from the park. Team 4, took a break to think of a team name better than ‘4’ and to proudly display the items they removed from the forest. 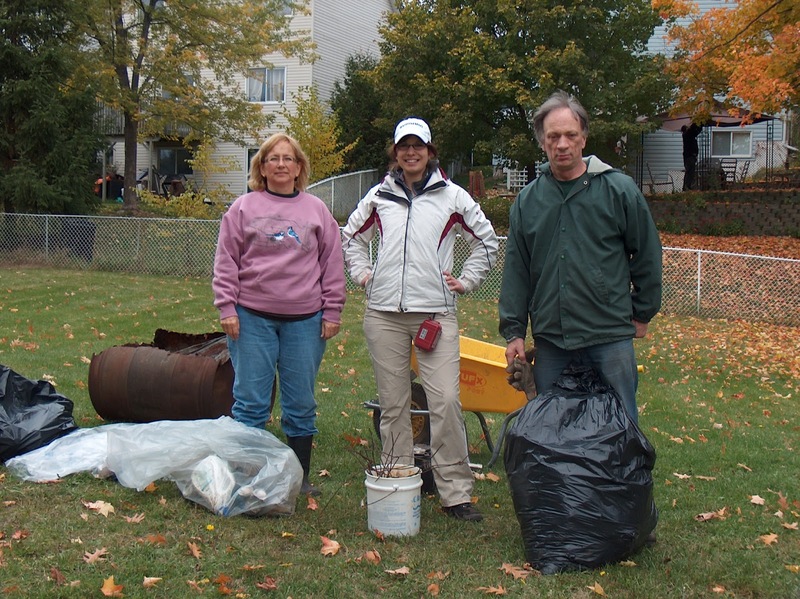 This amazing day was made possible through beneficial partnerships between community stewards, the HPSI and CSSP, and the City of Peterborough; we are particularly grateful to the Waste and Recycling department who provided the garbage bags and who also ensured that all materials were promptly removed from the designated lay-down area in Bridlewood Park. A most rewarding moment occurred when the resident of an adjacent home took the time to thank volunteers for making it safer for his family to walk in the park, demonstrating how special it is for people to experience, and introduce their children to, the native flora and fauna that abounds here. Therefore, we have decided to add a new page to our blog featuring photos of the park. Submissions will be given full credit and bragging rights. Just submit your photos to the: harperparkstewards@gmail.com and tell us a bit about your image and what the park means to you.